So I built a FT Versawing for my first plane. 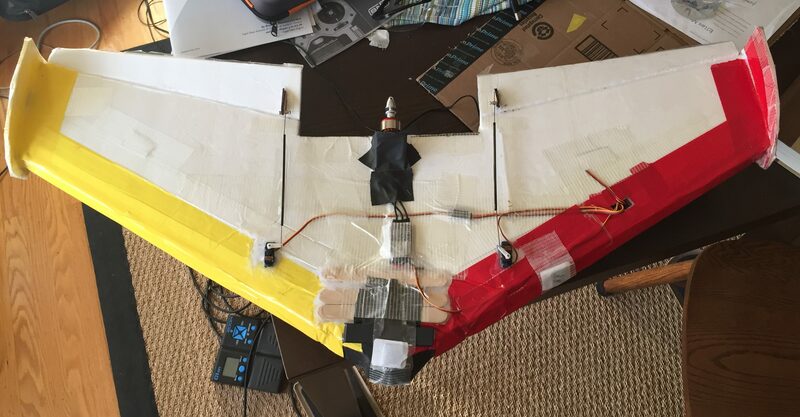 My first dozen flights were mostly crashes as I worked through a series of rookie problems with slipping control linkages, center of gravity, and a few other things. As a result, I've gone a little overboard on strengthening the thing with extreme packing tape, tongue depressors, and lots of hot glue. Including motor, and prop, and quite a few lead weights on the nose it now weights roughly 750g plus another roughly 250g for the 3s 35c 2200mah battery, with a slightly nose heavy COG. Through all the test flights so far, one challenge has been finding a place without too much wind (SF is very windy). My last few flights in relative calm, I definitely had control authority and was able to fly 150 feet or so despite a few gusts, but could not gain altitude much above 20-30 feet, despite having throttle at full and trying to pitch it up. I'm thinking I was too conservative on the power system - I used the FT powerpack B, which comes with what the site says is an Emax CF2822 and 20amp ESC. I don't know exactly what KV the motor is - I don't have the box for the motor anymore, it's not marked, and googling the model number yields a few different possibilities, but it seems like 1200kv? I've been using an 8x45 prop (balanced). Any recommendations on a more powerful motor? From reading and youtube, it sounds like I might want to consider something in the 1500-2000 kv range, with a smaller prop and probably higher wattage ESC? Any suggestions on particular pairings for something like this? If you're having to add so much extra weight, and don't plan on flying FPV anytime soon, I would convert this pusher setup to a tractor setup and you'll end up with a lighter plane that balances more easily without extra dead-weight. You'll probably find it more efficient for power and duration. I have a pusher versa with the Emax 2822 (1200kv) on a 8x6 slowfly and a 2200mah 3s. It has ok vertical and great slow speed. the emax 2822 get a little bit warm after 20 mins of flying but that isn't to bad. If you are having really bad tail heavy issues the try moving the motor forwards and cut a deeper slot between the elevons so it looks like the ft arrow. I'm reluctant to do that - every crash has ended with the plane slamming nose-first into the ground.